Since 2014, the Denver Broncos have been operated by a three-person trust, set up after longtime owner Pat Bowlen was forced to step down from his post due to advancing Alzheimer’s disease. 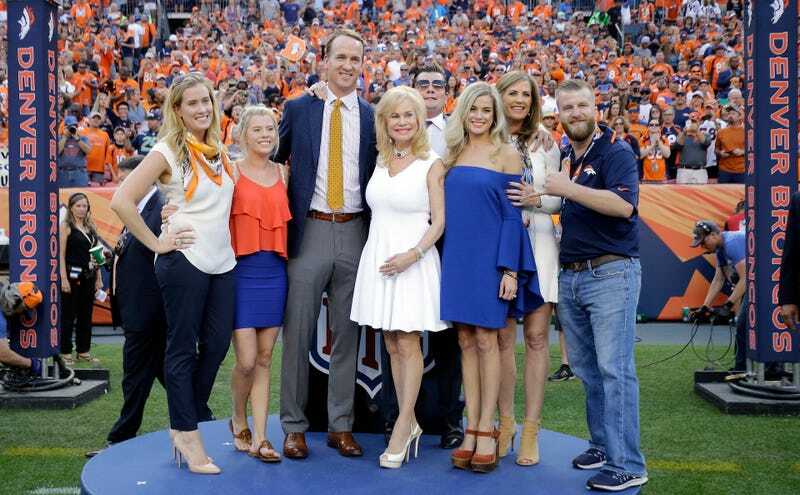 The trust was responsible for running the team, as well as deciding which of Bowlen’s seven children from two marriages would eventually take over the team and serve as controlling owner. Predictably, this King Lear situation has become very messy as various Bowlenspawn have begun to stake their claims over the Broncos and their $2.6 billion valuation. The Wall Street Journal and New York Times each published accounts about the fight for control of the team this week, and together they illuminate the particulars of the intrafamily squabble that’s been messy as hell for months. The Broncos trust is composed of Pat Bowlen’s confidantes and led by Joe Ellis, a former league office exec who has been with the Broncos for 20 years. According to the Journal, the trust favors handing off control of the team to Brittany Bowlen, the 28-year-old daughter of Pat Bowlen and his current wife Annabel. In the other corner, we have Beth Bowlen Wallace, Bowlen’s second-eldest daughter from his previous marriage to Sally Parker. Bowlen Wallace, 48, in May declared her intent to take over the franchise, which prompted the trust to release a feisty statement noting that Bowlen “made it clear that his children were not automatically entitled to a role with the team and that they would have to earn that opportunity through their accomplishments, qualifications and character.” Beth Bowlen Wallace also told the Journal that her father wanted her specifically to take over, a claim that Brittany has also made, but the difference is that other sources can confirm Pat Bowlen’s support of Brittany. Beth first began working for the Broncos in 2011, as the director of special projects. She stayed with the team until 2015, when she was fired by the trust, allegedly after she told them she was going back to school to finish up her law degree (she graduated from law school in May 2016). She told the Times that the trust isolated her and went through every possible effort not to let her acquire any influence within the organization. Feeling alienated in the team’s offices, Bowlen Wallace then tried to promote the Broncos by working with nonprofit groups, joining seven boards. Her growing role in the community apparently was also a threat, she said. Months after the trust fired back at Bowlen Wallace, days after talks between factions reportedly broke down, and only five days after Brittany Bowlen stated her intentions, Bowlen Wallace’s side struck back. Former minority owner Bill Bowlen, Pat’s brother, filed a lawsuit on Oct. 25 with the goal of dissolving the trust and getting a judge to “appoint an independent party to serve as conservator” of the Bowlen estate, thus paving the way for Beth, the most immediately qualified of Bowlen’s children, to take over. Beth also had the support of Pat’s brother John (a current minority owner) and her older sister Anne Bowlen Klemmer. Neither Bowlen Klemmer not Bowlen Wallace are party to the suit, since they forfeit future ownership stake in the team if they sue the trust. In response to the lawsuit, the trust asked the judge to hold off while the NFL stepped in to arbitrate the dispute. Bill Bowlen claimed late last week that such a request was merely an attempt to stall. For their part, the NFL refused comment to both the Journal and the Times, though Roger Goodell has commended the trust in the past. Looming over the proceedings is a third option, one that few in the Bowlen family seem to want. The trust is deputized to sell the team if none of the Bowlen children are deemed fit to lead. Pat would be extremely disappointed to have his family affairs play out in the public. The claims made by Ms. Wallace are simply not true, and the facts will come out in the appropriate forum.